Today it is not Easter in Russia. Easter is a moveable feast and its date has confounded great minds over the ages. We still have a major split in the Christian world between Orthodox and Catholic/Protestant, the eastern Europeans finding Easter’s date by the Julian calendar, the westerners by the Gregorian calendar. This famous bone of contention has caused rifts throughout history. Here in Britain what is known as the Celtic Church (more properly, the Irish Church) was suppressed because of it. I’m not going to begin to explain the trickiness of dating Easter, because I’m a bear of small brain and not a computus. What interests me is the name and the light it sheds – literally and metaphorically – on this particular festival. Twice a year, at spring and autumn equinoxes, the sun rises and sets due East and West, giving us two of the four cardinal points. Determining North and South requires instruments of calculation, but East and West are visible to everyone. You note where the sun rises and put up a marker. That will tell you where east is all the year round, even while the sun rises and sets in different places along its path each day. The Spring Equinox, named after the goddesss, Ostara, was called ‘Esotre’, the Germanic word which gives us east, eastern and Easter. It means dawn. Bede, who was a great computus of the date of Easter, writes of the pagan feasts held in her honour which in his time had recently died out, to be replaced by the ‘Paschal month’. Eostre is High German and the pagans Bede was referring to were Anglo-Saxons. We don’t know the name of the goddess to the Celts but it might be ‘Ausos’ (from austron, ‘dawn’). ‘Eosturmonath has a name which is now translated “Paschal month”, and which was once called after a goddess of theirs named Eostre, in whose honour feasts were celebrated in that month. Now they designate that Paschal season by her name, called the joys of the new rite by the time-honoured name of the old observance.’ Bede, De temporum ratione. (Note: ‘paschal’ derives from Hebrew pesach, meaning Passover). In the Celtic calendar there are between 40 and 46 days between each of the eight seasonal festivals of the year. Right now, in 2014, we have Easter Sunday on 20th April, just ten days from Beltane, and that is clearly wrong. The true feast of Ostara was over thirty days ago, just as the flowers were coming out in that magical period when dawn comes twelve hours after sunset and the soil begins to warm, the birds begin to sing, the snowdrops give way to primroses and the first blossom opens on the fruit trees. What seems to have happened is that the Christian ‘Paschal month’ absorbed and combined the festival of Ostara (spring equinox) and Beltane (beginning of May), which explains why May Day has no Christian equivalent and persists as both a secular and pagan festival. Beltane is staging a comeback these days and I hope will shortly give its name officially to May Day. If I were to clean up our modern calendar, as many would dearly love to do, I would give the name Ostara or Easter to spring equinox (as the Wiccans do), and for this shifting Christian festival I would give the name ‘Passiontide’. Pagans and chocolate-eating atheists would of course complain, but have no grounds for it, since their festival had simply been shifted back to late March. Equinox is the time for eggs, bunnies and all that procreative symbolism. Passiontide is a quiet time for reflections on death, rebirth, immortality. I don’t wish to deprive the kiddies of fun, just push it back a bit in time. Why shouldn’t we celebrate the movement of the year into spring? It doesn’t need any religious overlay at all. All we do at the moment is change a lot of clocks and watches, making the Wheel of the Year lurch foward. 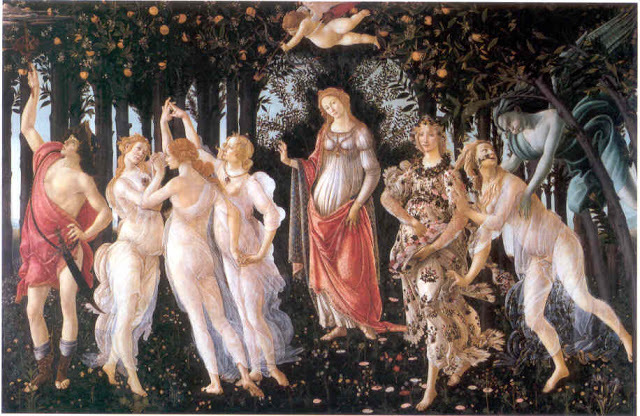 Oddly, all the interpretations of Botticelli’s La Primavera, ‘The Spring’, are uncertain when it comes to naming the central goddess and the one to her right. They are usually referred to as Venus and Flora. Let them stand for Passiontide and Ostara. And the one furthest to the right, the unadorned one? – Imbolc, or Brigit, the coming of the light to the year in February. This is not yet another interpretation of Primavera; I’m just using it as an analogy. Spring has three parts, beginning, middle, end. Brigit is the beginning, with her snowdrops and aconites, Ostara the middle, with her primroses and daffodils, and Beltane heralds the the beginning of summer with apple and hawthorn blossom. 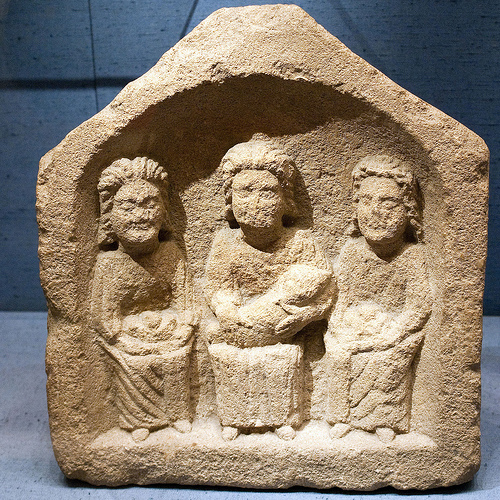 This is an aspect, of course, of the Matronae, the three mother goddesses, shown as nymph, matron and crone. 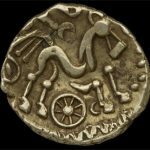 The Celts knew the year better than anyone. They lived it, lived in it, and life was an eight-spoked wheel. Rather than follow the muddle which is the combined Christian-pagan calendar of today’s secular world, I try and separate them. My life in the world is governed by the calendar of Roman gods, emperors and numbers, a very messy arrangement but universal (even the Orthodox follow the Gregorian calendar in daily business), but my life in the garden is lived under the ancient calendar of heathen gods and goddesses who govern the birth, growth and death of things. We live by two wheels – it just makes life richer.